The most important investment you make during graduate school or your postdoc is in your career. 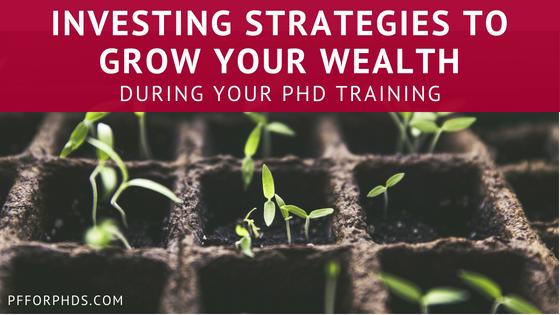 But alongside that primary objective, many PhDs also invest money during their training. By far the top challenge or impediment to investing during graduate school or a postdoc is the low pay, and only a fraction of trainees are financially able and ready to invest. However, investing even a small amount of money on a regular basis throughout graduate school and a postdoc can have an enormous impact on lifetime wealth. The even better news is that the process of investing itself is simpler and easier than you probably think. Many investors, both novice and experienced, fall into the trap of thinking that to maximize their investment outcomes, they should focus on choosing the best investments. In fact, there is no reliable way to pick winning investments. There are only three aspects of your investments that affect your investment outcome that you can control: your savings rate, your investment asset allocation, and the cost of your investments. This article outlines how to grow your wealth during graduate school by optimizing those three factors and implementing a few other key strategies. Empirical studies have borne out time after time that passive investing is a more successful strategy than active investing after costs are factored in. Basically, what that means is that buying a set of investments that is representative of a market sector overall (e.g., the entire stock market) is more successful in the long term than trying to pick winners from that same sector. In trying to beat the market, both professional investors and individual investors consistently fail to even match it. Passive investing is a far simpler strategy than active investing and much less time-consuming to initiate and maintain because there are plenty of high-quality passive investment products available. To enact a passive investing strategy, buy an index fund or an indexed exchange traded fund (ETF). For example, there are index funds and ETFs that reflect the entire stock market or the S&P 500, among numerous others. The great bonus here is that passive investing is far more time-efficient than active investing. You don’t have to research individual investments to death; just buy them all! Instead of putting your time and energy into agonizing over your investment choices and trying to optimize them, direct it toward increasing your savings rate into your investments. You can free up more cash flow for your investments by decreasing your expenses or increasing your income. As simple as that sounds, every grad student knows that both time and money are very tight during this phase of life. If you pursue increasing your income or decreasing your expenses, you must be very selective about how you do so. The following posts discuss both of these strategies in much more detail. Can a Graduate Student Have a Side Income? Your asset allocation is the percentage of your investment that is in each asset class or sub-asset class. The three main asset classes are stocks, bonds, and cash. Your asset allocation should be chosen with respect to your investing goal. For a very long-term goal, such as retirement for someone in her 20s or 30s, a very aggressive asset allocation is appropriate, such as 80-100% stocks. If you are a DIY investor, your brokerage firm can help guide you to an appropriate asset allocation. Your asset allocation should change as the timeline on your goal grows shorter, but not quickly or dramatically. A common pitfall that investors fall into is trying to time the market by changing their asset allocation, i.e., they pull money from stocks into bonds or cash when they anticipate a stock market drop and then try to find the right time to push it back in. While the theory of selling high and buying low is fine, it’s almost impossible to successfully time the market consistently, even for professionals. Instead, maintain your appropriate asset allocation and ride the market down and up. All investments have costs associated with owning and transacting them. You can think of those costs as directly coming out of your investment returns. Over the course of several decades of investing, these costs can reduce your balance in retirement by hundreds of thousands of dollars! In fact, costs are one of the big reasons that active investment strategies fail to perform as well as passive investment strategies. While active strategies sometimes do generate higher top-line returns than passive strategies, their higher cost almost always knocks the real return experienced by the investor below than that of passive strategies. With mutual funds, index funds, and ETFs, the cost of owning the investment is expressed very clearly in its expense ratio (a percentage). A low-cost ETF or index fund will have an expense ratio of a couple tenths of one percent or lower, while a high-cost, actively managed mutual fund will have an expense ratio of one percent or higher. For a passive strategy, look for funds with very low expense ratios. Watch out as well for fees tacked on top of the expense ratio of the fund you purchased itself; these are often charged by the person or institution managing the account, such as a 401(k) administrator, a financial advisor, or a roboadvisor. Make sure that you have a compelling reason for paying such a fee before signing up for one, because it will come directly out of your returns. The strategy of dollar cost averaging (as opposed to irregular lump sum investing) is to invest a set amount of money on a regular basis. If you receive a regular stipend/salary, this translates to investing the same amount of money every pay period, ideally through an automated transfer. One of the big advantages of dollar cost averaging is that committing to the strategy prevents you from attempting to time the market. When you use your discretion over the timing of your investment schedule, many of us will try to guess whether the market is on an upswing or downswing and shift our buying behavior accordingly. This is rarely a successful strategy, whether it is done haphazardly or very deliberately. In fact, dollar cost averaging actually guarantees that you “buy low and sell high” in a sense, although you are not selling. Because you invest the same dollar amount every period, when the market is low you buy more shares and when it is high you buy fewer shares. If your investing goal is to save for retirement – likely the first investing goal you should set as it is the longest-term – it is a great idea to use a tax-advantaged retirement account. A tax-advantaged retirement account protects your investments from taxes over the decades between your contribution and withdrawal in retirement; paying tax year after year would otherwise eat away at your returns. Therefore, using a tax-advantaged retirement account maximizes your returns, as long as you abide by the restrictions on access that it imposes. Only very rarely do graduate students have access to a tax-advantaged retirement account through their universities; therefore, an individual retirement arrangement (IRA) is their only option if they are eligible. Some postdocs receive retirement account benefits through their universities and some do not. IRAs are set up independently and managed entirely by the investor. This may sound like a big responsibility, but this freedom of choice means you can pick the optimal investments for you. IRAs come in two varieties: traditional and Roth. Roth IRAs are generally recommended for current lower-earners with great income growth potential, so they are an excellent fit for graduate students and some postdocs! Receive a 700-word letter on which brokerage firm I use for my Roth IRA and what it's invested in. Probably the biggest investing mistake you can make is to procrastinate getting started. On average, the stock market ends two out of every three years higher than it started; if you’re ready to start investing but put it off, more times than not you miss out on earnings that could have gone into your coffer. I frequently speak with PhDs-in-training who stay stuck in investing analysis paralysis for years on end. You can always course correct if you realize you made a poor choice with your investments initially, but you can never recover lost time. So even if you aren’t confident you’re making the perfect investment, just get started! Investing is one of my favorite subjects on which to teach, write, and coach, and my enthusiasm for the subject is due to the thrilling experience I had with investing during my seven years of PhD training. Starting at $0 in 2007, my husband (also a grad student over the same period) and I together grew our retirement investment portfolio to approximately $75,000 by the time we defended in 2014. The success we experienced is largely attributable to our aggressive and increasing savings rate and the long bull market that started in 2009. I had an inauspicious start with investing when I first opened and funded my Roth IRA. I didn’t actually purchase the investment I intended to when I opened my account, so my money was going into cash! The really embarrassing part of the story is that I didn’t catch my mistake for over a year. When I finally did, I moved my IRA from that first brokerage firm to one I preferred and made sure that all my money went into my investment of choice, a target date retirement fund. Deciding that a target date retirement fund was right for me only took a couple hours of research, and as it’s a set-it-and-forget-it strategy I have spent zero time over the last decade-ish maintaining it (though I do regularly check the balance). Instead of spending my time and energy monkeying with my choice of investments, I used them to find ways to add more money to my investments. When I first started contributing to my Roth IRA in 2007, I saved 10% of my gross income, which was $200/month. After we married and combined finances, my husband and I set a lofty goal to max out two Roth IRAs each year. We used frugal strategies to incrementally reduce our spending to free up more money for investing. (Our top five frugal strategies alone helped us reduce our yearly spending by approximately $6,000.) While we didn’t quite achieve our goal during grad school, we did end with a 17.5% retirement savings rate. Investing is about far more than just numbers to me. Investing throughout graduate school has not only given my family financial security, but it enabled both my husband and I to pursue our post-PhD dream jobs, even though they are risky and less remunerative in the short term. I want other early-career PhDs to experience a similar degree of financial freedom as soon as possible in their lives, which is why I am such a proponent of investing even during the incredibly financially challenging graduate and postdoc training periods. 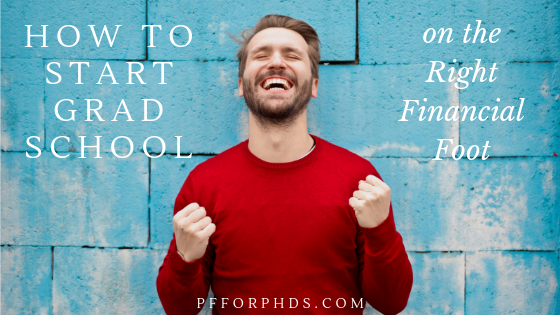 If you’d like to go even deeper into this subject matter, sign up for my free 7-day email course on investing for early-career PhDs. Should a Graduate Student Save for Retirement in a Roth IRA? For graduate students with sufficient stipends, investing during graduate school is a fantastic financial goal. Counterintuitively, the long-term goal of funding retirement should be the first or one of the first investing goals any individual has. 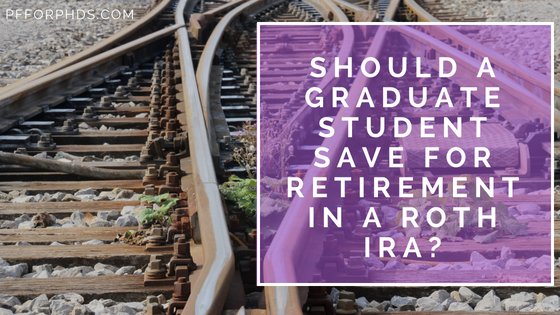 An Individual Retirement Arrangement (IRA) may be an appropriate vehicle in which to invest during graduate school, when the vast majority of graduate students do not have access to a retirement account at their universities such as a 403(b) or 457. But not all graduate students are eligible to contribute to an IRA, and an IRA is only the best choice for certain investing goals. If a graduate student opens an IRA, she must choose either a Roth or a traditional version. An IRA protects your investments from being taxed while they are growing. An IRA is not synonymous with certain investments, but rather is an envelope around whatever investments you have chosen. As the name implies, the IRA is intended to be used for retirement savings, and by protecting your investments from taxes over the decades, your investments will grow at their fastest possible rate. Due to the power of compound interest, not having to pay tax on the growth of your investments can make a significant positive impact on their value. Therefore, it is a very good idea to use tax-advantaged retirement accounts to the greatest extent of your ability. In 2018, the contribution limit for people under the age of 50 is $5,500 per year or your amount of taxable compensation, whichever is lower. You can make contributions to your 2018 IRA until April 15, 2019. Many brokerage firms require a certain minimum account size that may be too high for a grad student just starting out with saving. If that is the case for your preferred brokerage firm, you can save into a savings account or IRA at another brokerage firm (some waive account size minimums if you set up a monthly auto-transfer) and transfer the money when you reach the minimum. Only taxable compensation (previously known as earned income) can be contributed to an IRA. A graduate student’s stipend is taxable compensation if it is reported on a W-2 at tax time. If a grad student has only fellowship or training grant income during a calendar year (not reported on a W-2) and no outside income, he will not be able to contribute to an IRA for that year. Senators Elizabeth Warren and Mike Lee proposed the Graduate Student Saving Act of 2016, which would include fellowship stipends as taxable compensation for the purposes of IRA contributions, but it was not enacted. If you are married to a person with taxable compensation, you can contribute to a spousal IRA, again subject to the limit of $5,500 or the amount of taxable compensation. There are income limits as well for IRAs, but they are much higher than grad student stipend levels. If your stipend is not taxable compensation, you can still save for retirement, though it may not be inside an IRA. Is a Roth or a traditional IRA better for a graduate student? There are two versions of IRAs available: Roth and traditional. The first-pass difference between the two types of accounts is when you will pay income tax on the money inside it. While the money in your IRA grows tax-free, you do have to pay income tax either upon the contribution (Roth IRA) or withdrawal (traditional IRA). Initially, when people decide between the Roth and traditional IRA, they compare the marginal tax rates the taxpayer will be in upon contribution vs. withdrawal. The idea is to opt to pay the tax when they are in the lower marginal tax bracket. You know your marginal tax bracket currently; for graduate students without outside income, it is usually the 15% tax bracket or lower. You do not know what your marginal tax bracket will be during your retirement, as both your income and the tax brackets themselves will change in the intervening decades. However, this educated guess applies to the majority of graduate students: You are currently in a relatively low tax bracket because you are in training and building your career. Later in your life, you expect to have a much higher income and be in a much higher tax bracket. If that assumption holds, the Roth IRA is the more appropriate choice. Virtually every graduate student I’ve spoken with about this has chosen to contribute to a Roth IRA during graduate school. The Roth IRA has some additional flexibility that the traditional IRA does not that may be attractive for graduate students. What are the pros and cons of using a Roth IRA? As graduate students usually lack access to other tax-advantaged retirement account options, the best practice is to only contribute money to a Roth IRA that you intend to invest for retirement. This is in line with the government’s purpose in creating IRAs. The main con of using any tax-advantaged retirement account is that accessing the funds earlier may trigger an income tax payment and a 10% penalty. However, the Roth IRA is unusually flexible. As you have already paid income tax on the contributions to your Roth IRA, you can remove them at any time without additional tax or penalty. Five years after opening a Roth IRA, a first-time home buyer can remove up to $10,000 without incurring a penalty. Because of the Roth IRA’s flexibility, some people use it “off-label” as a general savings vehicle. Others may make contributions even if they are not 100% sure they will preserve the money for retirement. Just be sure to match your investment strategy with your intended use for the money; the type of investments you choose for long-term money should be different than those for mid- or short-term money. Of course, saving for retirement is not an appropriate goal for every graduate student. If you are currently taking on debt (student loans, personal loans, credit cards), your first priority should be to minimize that debt acquisition or even start to repay it. If you can keep your head above water with your stipend but don’t have any kind of cash savings for emergencies or short-term expenses, saving those funds should be your goal, not investing (yet). Even graduate students whose stipends allow for saving may not want to start investing for the long term if they have other financial priorities and their values don’t align with early wealth-building. If you are a graduate student with a livable stipend who values financial security or independence, using a Roth IRA for your retirement savings is a wonderful choice. If you don’t have taxable compensation, you can still save for retirement in another vehicle. If you aren’t sure what financial goal you are saving for, using a Roth IRA is an option but saving in a taxable account is almost as beneficial and prevents the different purposes from becoming confused. Did you save for retirement during graduate school? If so, did you use a Roth IRA? 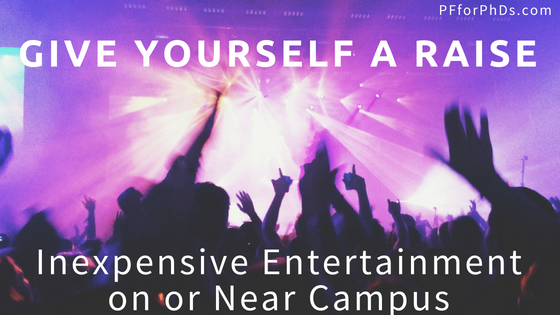 During graduate school, you’re heavily investing in yourself and your career. You’re sacrificing significant income potential to receive super-advanced training in your field. You’re probably anticipating a large income jump upon exiting grad school. Why should you even try to make your stipend income work for you? Is it possible or feasible to start investing while you’re so consumed by graduate school? Einstein declared that compound interest is the most powerful force in the universe. Just kidding – that’s an oft-misattributed quote. But compound interest is amazingly powerful: When you invest money and achieve a rate of return consistently over time, your money experiences exponential growth. The growth in your account balance itself is what grows with time. You make a one-time investment of $5,500 (no ongoing contribution). Below is a table of your account balance at different points in time, given different rates of return. Now imagine how your earnings would layer and multiply as you consistently invest year after year throughout your career! Given enough time and a reasonable average rate of return, even a modest amount of yearly savings can turn into millions of dollars. Compound interest works for you in the case of investing (if irregularly), but it works against you in the cases of inflation. The long-term average rate of inflation in the US is a little above 3%. That means that you must invest your money to get a rate of return of at least 3-4% to just maintain its purchasing power! The principle behind the power of compound interest teaches us that the more time given to the process the better it works for you. Graduate school is a wonderful time to start investing for the long term, if you haven’t already. You won’t be able to save much money, at least not in comparison with how much you might after graduating, but the extra few years of compounding will work their magic and over the decades that small amount of money will grow into a staggering sum. 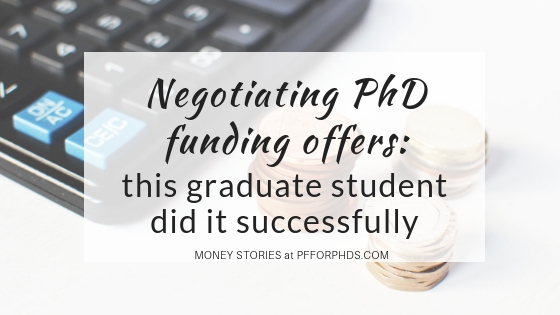 Many graduate students are intimidated by the prospect of investing. They suffer from analysis paralysis at several different steps and end up doing nothing, even if they have the capital available. My goal is to dispel the misconception that investing has to be difficult or time-consuming. Certainly if you want to make a hobby of investing you can spend a considerable amount of time on it, but that’s absolutely not required. 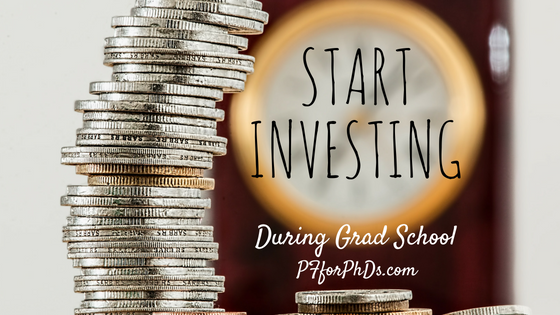 The average graduate student can invest quite successfully while spending only a few hours to set up the investment and a few minutes over the course of a year checking up on it. The approach to investing that is most successful and time-efficient is called passive investing. When you passively invest, you strive to get the same returns in your personal account as some sector(s) of the market. You are not looking to beat the market, but rather match it. This is in contrast to active investing, which involves picking individual investments and timing the buying and selling to try to beat the market average. When these two approaches have been compared head to head, the passive investing strategy beats out the active strategy 80% of the time. Plus, it’s simpler, easier, and cheaper. Because the passive investing strategy is a buy and hold strategy, the significant time investment is up front to research and choose your index fund(s). This can be done in as little as a few minutes or as much as tens of hours, depending on how thoroughly you want to understand the investment. Once you have made your choice, you can just glance at the account balance a few times per year to make sure it’s in line with your expectations (given how the market is behaving). If you are investing for retirement, your first decision is whether you can or should use a tax-advantaged retirement account, such as an individual retirement arrangement (IRA). (You must have taxable compensation to contribute to an IRA.) It’s very rare, though not totally unheard of, for graduate students to have access to a workplace-based retirement account, such as a 403(b). If you are opening an IRA, you will have to choose between a Roth and a traditional version. Your next decision is where to open your investment account (IRA or taxable). Most DIY investors would do well to choose a brokerage firm. Vanguard, Fidelity, and Charles Schwab are all excellent, though not the only, options for low-cost index funds. With a brokerage firm, you will have a wide selection of investment options available to you (unlike at most banks). You can open and fund such an account completely online. The next step is actually choosing your index funds, which is the one where you might spend the most time. Brokerage firms often offer similar index funds to one another, as they are all trying to replicate the same market sectors, though there may be subtle differences in the holdings or the cost. These brokerage firms usually offer tools and quizzes to help you identify the right investment for your time frame and risk tolerance. If you don’t know where to start your research, check out target date retirement funds. They assume a risk tolerance for you based on your projected retirement year (e.g., 2055), and then invest in a small number of index funds to create an appropriate asset allocation. This type of fund handles all the necessary rebalancing among the index funds, so it is a totally hands-off investing strategy. For this reason, it is great for a graduate student who wants a set-it-and-forget-it investment strategy. If you have already started investing, are you using a passive strategy? Have you suffered from analysis paralysis with respect to investing? How are you harnessing the power of compound interest?